As you might have noticed, I am a bit of a weather obsessive. It affects almost everything I do at work and play. If I'm out in the garden digging and planting, or in the woods shinning up trees, or even if I'm in town, clambering across the rooftop gardens of London, I find myself constantly scanning the horizon for the next inclement weather front. 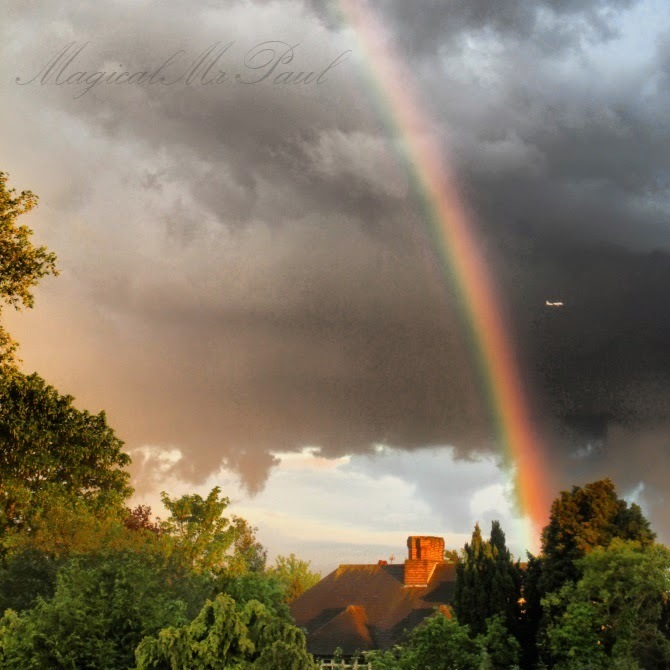 So in a completely random offering, I wanted to share what I consider to be, the most wonderful image I captured of a gorgeous rainbow over the house, whilst I was out pottering in the garden. I had just enough time to grab my phone and take a picture as a plane flew right through the colours of the rainbow. With dramatic, bubbling skies serving as its backdrop, the arc also appears to land directly on the roof of the house. How lucky to fly through the path of a rainbow. Isn't that just about as beautiful as it gets. Here's wishing you all a Magical weekend. I was really enjoying your post and darn you had to leave and return to work. I love the rainbow and the airplane. You have a keen eye and what a marvelous photo. That is a magical photo, Paul! I am not sure that I have ever seen a rainbow in such a grey sky. What a fabulous photograph, Paul! Magical indeed! Dear Paul - that really is a bit of magic, it looks almost like an old master painting. Don't forget that there is a pot of gold at the end of the rainbow, so get digging quickly. Magical moment captured by Mr Magic himself. Perhaps that is where you got your magic in the first place... at the end of a rainbow somewhere...? :-) Paul, this photo is stunning in so many ways and I agree with Rosemary, it does look a bit like a painting by one of the old masters. And what a garden you have! Magic all around!!! Great photo Paul! Oh to have a job like yours.....being outside all day. That doesn't sound bad at all!! Wow, that is such a beautiful photo. I'm glad you had your phone with you to capture it. Just amazing, Paul I'm always watching the skies for photo ops. You just never know. have a wonderful week. Truly magical moment Paul! The colours are so vivid. You captured it in the perfect moment with the plane flying by. Have a magical weekend too. wow - that photo is worth the pot of gold that stands down at the end of the rainbow! Utterly beautiful - a wonderful chance that you turned into a golden capture in a moment! I would scarcely believe this except I just had a wild buffalo put his head in my unrolled window in the car to grab a bite of my PayDay. So glad you looked up!! !